Priced affordably with both an 18mm to 55mm and 50mm to 200mm kit lenses, Pentax’s 10.2-megapixel K2000 may tempt quite a few people to jump into the digital SLR pool. 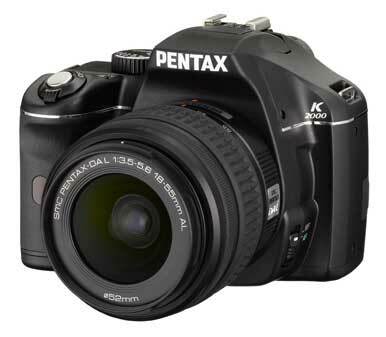 Though the supposed niche for the K2000 consists of consumers new to the DSLR market, the camera’s compatibility with previously issued lenses could increase the K2000’s appeal to Pentax enthusiasts of all stripes. That’s especially true if you have a collection of Pentax lenses, as this camera accepts any lens from the Pentax line (keep in mind, though, that you may have to focus legacy lenses manually). Pentax has also retained in-body image stabilization, so any lens you add will also be stabilized. And according to our tests, the K2000’s image quality stands up to that of the best DSLRs out there. In our lab evaluations, the K2000 outperformed much of the recent DSLR pack in many critical areas, particularly in color accuracy, exposure quality, and overall image quality. The K2000 also scored decently in sharpness and distortion levels. All in all, the camera earned lab rating of Superior for image quality. In my tests, the K2000’s burst-shooting mode performed a bit more slowly than the manual claimed it would (2.5 frames per second). However, I was using a slower SDHC card (by PNY), whereas a faster card might have helped the write speeds. I also found the focus to be a little slow: Unlike its more-advanced and more-expensive DSLR competitors, the K2000 does not allow you to manually select a focus point beyond ‘center’. In all-automatic mode, that led to more off-focus shots (with ill-chosen depth of field) than I would have liked, when I thought the subject was obvious, even centered. The poky, virtually uncontrollable focus is a major turnoff in an otherwise appealing camera; other cameras in this class, and even below, offer selectable focus points. Fortunately, despite the focusing speed the K2000 often produced sharp images, very good color accuracy, and punchy contrast (both saturation and contrast are adjustable via custom settings) in the JPEGs I took with the kit lens. The K2000 keeps up with other DSLRs by offering dynamic range expansion, a useful feature that was particularly effective at providing shadow detail in my tests. That said, the feature fell a little short at reining in the brightest highlights. I found that dialing down the exposure by one third and doing a little doctoring in Photoshop was a reasonable solution much of the time. The ISO ranges from 100 to 3200, but the K2000’s performance at high ISOs was not as impressive as that of Pentax’s K20D ($1100) or other cameras in the same class. Chromatic noise became a problem, and images softened considerably, at and above ISO 400. In addition to full manual controls (including white balance control, in-camera RAW development, and an LCD that you can color-balance), the K2000 provides an array of scene modes; recording filters such as bright, natural, and landscape; and a small assortment of entertaining post-recording filters that you can apply to saved images. I particularly enjoyed the results from the Soft Focus, Toy Camera, and Illustration filters. (You can achieve such results in an image editing app, of course, but here you have instant gratification.) The K2000 also offers Retro (which adds a yellowed border, as old color prints used to have), black-and-white, and sepia filters, along with a somewhat ridiculous Slim filter that, when applied to a recorded image, distorts the picture and gives your subject a horselike head. Despite being only an occasional Pentax shooter, I found the K2000 quite intuitive to use; I needed to consult the manual just a couple of times. Easing the road for first-time DSLR users is the Help button, which is located next to the shutter release; the question-mark-labeled button provides explainers for all the major camera functions. You simply press it and then select the feature you want to know more about. However, beginning DSLR users will need to get used to the fact that the 2.7-inch LCD on the back of the camera can’t act as a viewfinder. That function is reserved for the optical viewfinder, while the LCD displays menu navigation, the Help-button explainers, and in-camera settings. I found the menus easy to navigate, and the LCD has a wide angle of view. Despite being on the small side of the DSLR spectrum, the K2000 feels solid in the hand and looks as tough as a tank. It’s also lightweight, partly thanks to a slight redesign of the 18-55mm kit lens, which has a plastic mount instead of a customary metal mount (the mount on the body is metal). This camera is light and small enough to wield one-handed, which is great when you’re out and about in the park or chasing kids and animals. In a convenient touch, the K2000 runs on four AA batteries. Our lab tests didn’t cover the battery life for this digital SLR, but in my hands-on tests the battery held up very well: The K2000 got through 100 shots without putting a dent in the battery life. Overall, despite the Pentax K2000’s stellar image quality and what the company has done to make this model appealing and easy to use, it is difficult to recommend the K2000 wholeheartedly due to its focusing shortcomings. If you have an arsenal of Pentax lenses, I’d advise laying out the cash for a higher-end Pentax model. If you’re looking for a more complete package of features, offerings from Canon, Nikon, and Sony scratch that itch a bit better.